Architect Expo stages a complete range of products and services in the construction and building industries to its visitors. 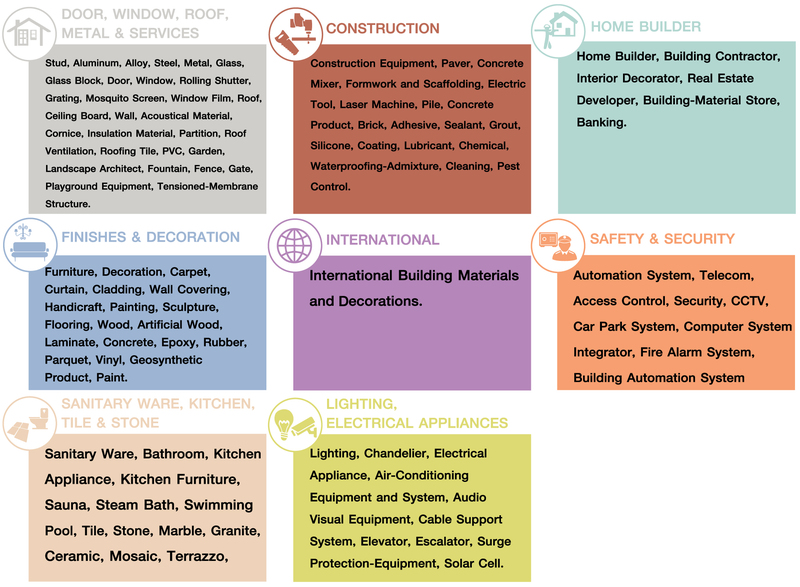 Each type of product and service is grouped together in a specific zone. Stud, Aluminum, Alloy, Steel, Metal, Glass, Glass block, Door, Window, Rolling shutter, Grating, Mosquito screen, Window film, Roof, Ceiling board, Wall, Acoustical material, Cornice, Insulation material, Partition, Roof ventilation, Roofing tile, PVC, Garden, Landscape architect, Fountain, Fence, Gate, Playground equipment, Tensioned-membrane structure. Furniture, Decoration, Carpet, Curtain, Cladding, Wall covering, Handicraft, Painting, Sculpture, Flooring, Wood, Architect wood, Laminate, Concrete, Epoxy, Rubber, Parguet, Vinyl, Geosysthetic product, Paint. Sanitary Ware, Bathroom, Kitchen appliance, Kitchen furniture, Sauna, Steam bath, Swimming pool, Tile, Stone, marble, Granite, Ceramic, mosaic, Terrazzo. Exhibiting & presentation from related faculty in Architecture & Design from major universities and institutes in Domestic and International. Home Builder, Building Contractor, Interior decorator, Real estate developer, Building-material store, Banking. Automation system, Telecom, Access Control, Security, CCTV, Car park system, Computer system integrator, Fire alarm system, Building Automation System.